Pick up these ultra vintage WII U.S Paratrooper Corcoran Jump boots on ebay for only $60.00. 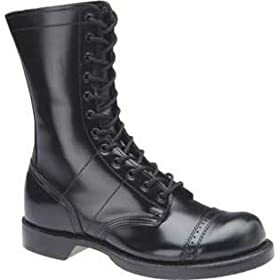 These are a historic pair of boots which any lover of vintage, 1940s or military style should own. Match them with a contemporary look : a pair of grey Uni Qlo skinny jeans with a funky T, leaving the boots untied.